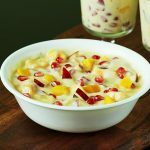 Fruit custard recipe with video & step by step photos – creamy, delicious & flavorful fruit salad made with custard & fresh fruits. 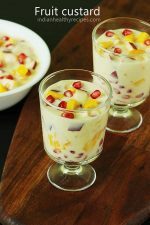 Similar to popular Indian desserts – Gulab jamun and Carrot halwa, a chilled fruit custard makes its presence in most special meals and parties. Fruit custard can be a great summer treat to your friends, family and guests. 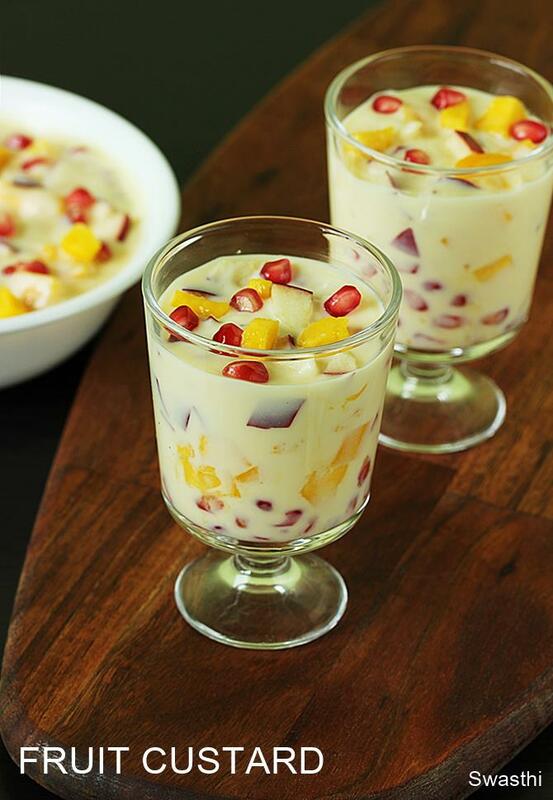 Fruit custard is a dessert made by mixing chopped seasonal fruits with chilled cusard sauce. Custard is a saucy dish that was traditionally prepared with cream, milk and eggs. Today one can find so many ways of making a custard. The simplest way is to use a store bought custard powder like I have done for this post. I have used a eggless custard powder that has no artificial colors and flavors. There are lot of brands selling custard powder. Apart from basic vanilla flavor, it is also available in different flavors like banana, apple, pineapple and mango. But most of them are artificial flavors so I use only the basic one. Custard powder is nothing but corn starch or corn flour with flavoring ingredients added to it. So If you are not accessible to custard powder, you can make your own using corn flour (corn starch) or arrowroot powder. To flavor the custard, just use vanilla extract or vanilla bean pod. 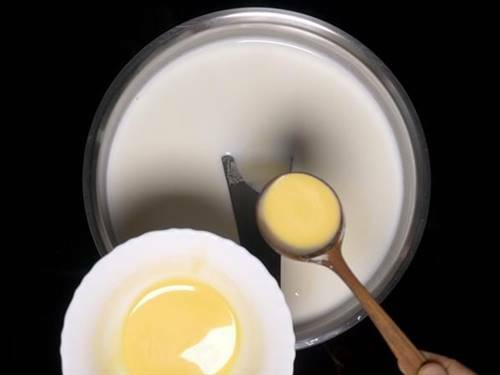 To enhance the flavor of custard you can also use 3 to 4 tbsp dry milk powder. Any seasonal fruits go well in this dessert. 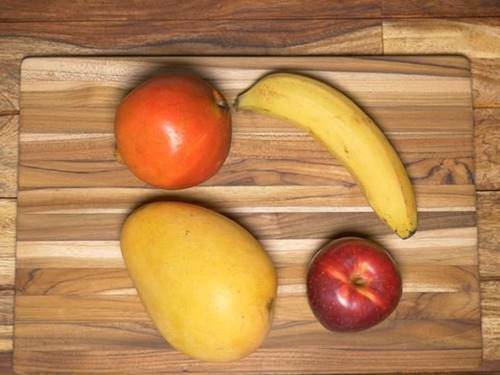 But most often I use banana, pomegranate, mango and apples. It is good to use sweet fruits and avoid sour ones. Do not use citrus fruits like oranges, grapefruit or mandarins. I also avoid grapes and pineapple too. Is is okay to serve fruit custard to young kids or toddlers? When my kids were very young I never made fruit custard recipe with dairy milk. As fruits and milk make a incompatible combination they are most likely to disturb the tummy and digestive system. 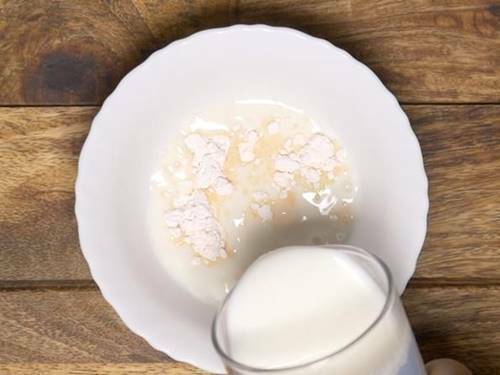 So I would make my own almond milk and stir in some arrowroot powder. Then cook the custard until thick and then add fruits. I have added more details in the recipe notes to make fruit custard recipe with almond milk. Can I make custard recipe without fruits? Yes you can make the custard recipe the same way and add some dry fruits and nuts instead of fresh fruits. You can completely skip the sugar in the recipe and add dates, figs, almonds, pistachios, jelly and tutti fruttis. As my kids are fussy I do not add dates but just add nuts, jelly & tutti fruittis. This dry fruits custard will make an amazing chilled dessert for kids’ parties. 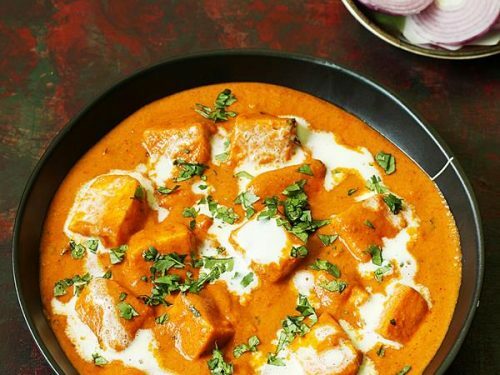 If you plan on this, just ensure to add the dry fruits & nuts only before serving. You can add 2 tbsps cocoa powder to the same recipe to make chocolate custard. 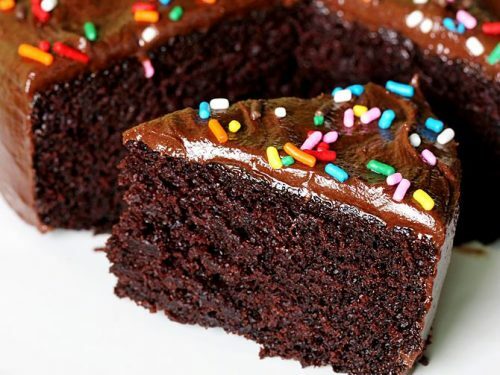 This version can be made with brown sugar for intense chocolate flavor. 1 cup of thick sweet mango puree can be stirred in the cooled custard to make mango custard. I haven’t tried with any other fruits yet. 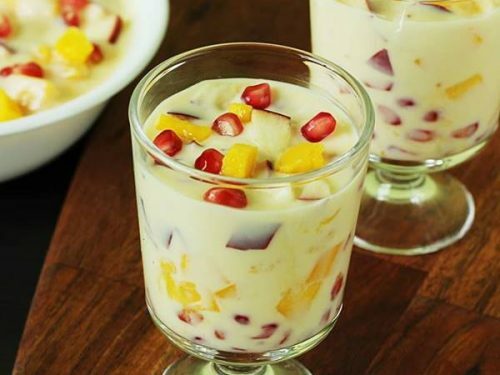 Fruit custard is a dessert made by mixing different cut fruits in chilled custard sauce. 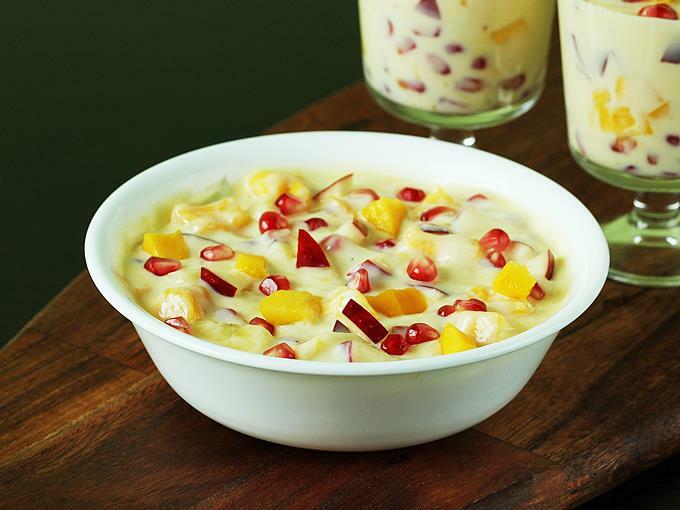 Any sweet tasting fresh fruits go well in this fruit custard recipe. Always serve fruit custard as a chilled dessert. 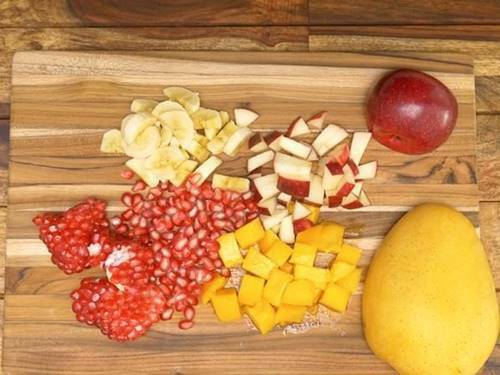 Wash the fruits thoroughly and chill them in the fridge. 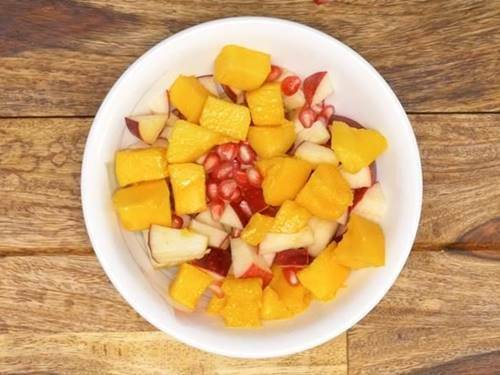 Refrigerating after chopping will let out juices from the cut fruits making the custard runny. 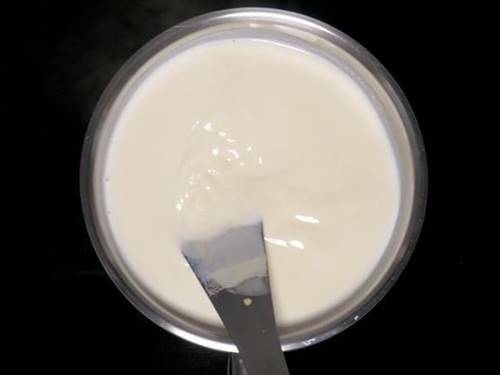 Heat milk in a wide pan or sauce pot. Meanwhile add custard powder to a small cup. Then pour 3 to 4 tbsp of milk to it. Stir well. Make sure it is free from any lumps. When the milk turns hot, pour 2 tbsp of the mix to the hot milk. Stir it until well incorporated. Repeat adding little more and stir well. Pour the rest of the mix and stir well to prevent lumps. Keep stirring and cook on a low to medium heat until the custard turns thick. The custard must coat the back of the spoon well but must be yet of runny consistency. 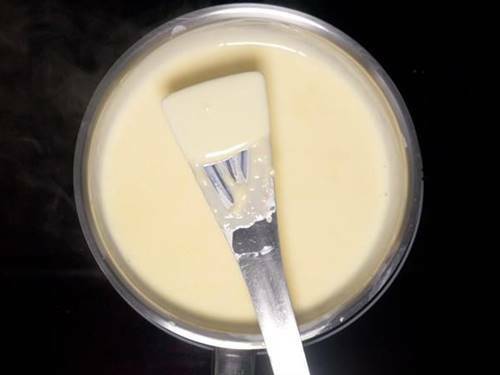 Switch off the stove and whisk the custard well to make it smooth. Cover immediately. Cool this completely and chill it in the fridge. 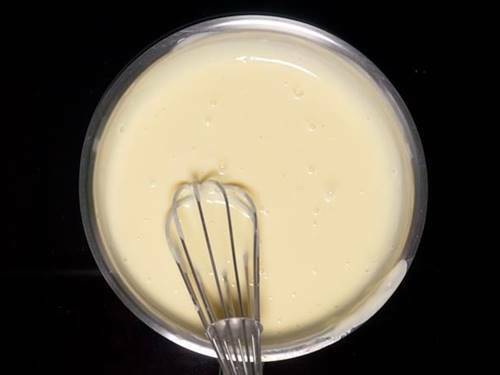 Whisk the custard well before serving. This ensures even and smooth fruit custard. Peel and chop the fruits to bite size. Add them to serving bowl or individual serving cups. Pour the custard over the fruits and gently mix. For healthier option use arrowroot powder but do note that even arrowroot powder is starch. If using corn starch or arrowroot powder to make your own custard powder, then use vanilla extract or vanilla bean pod to flavor it. Also dry milk powder enhances the flavor of custard. If you plan to make the recipe vegan. Soak about 1/3 cup of almonds for 2 to 4 hours in ample amount of water and blend them with 1 cup water and strain to a cheese cloth. Then add back the pulp and pour another cup of water to the mixer. Blend again and strain. 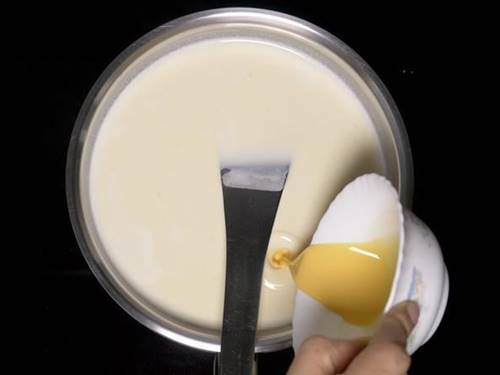 Use the same milk to cook the custard as mentioned above in the recipe card. I use up the pulp in vegetable stir fry. 1. Add custard powder to a small mixing bowl. Pour 4 tbsp of milk and mix well. 2. The mixture has to be smooth without lumps. 3. 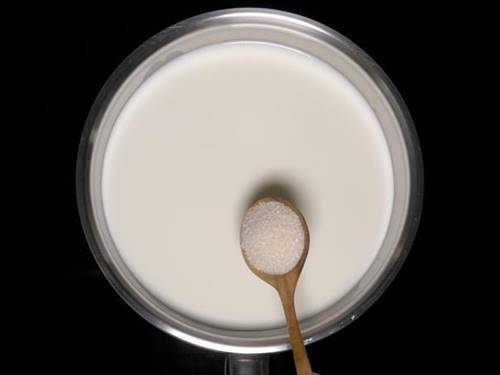 Add sugar and milk to a pan. Begin to heat it on a medium flame. 4. When the milk turns hot, add custard milk in batches. I add 2 tbsps of the custard milk each time. Pouring all the cornstarch at one time may make the custard lumpy. 5. Mix well and incorporate the custard milk. 6. Add some more custard milk and stir well. Add the entire custard milk in 3 batches. 7. Stir well as it continues to boil. With in few minutes, the mixture turns thick. Turn off the stove. 8. 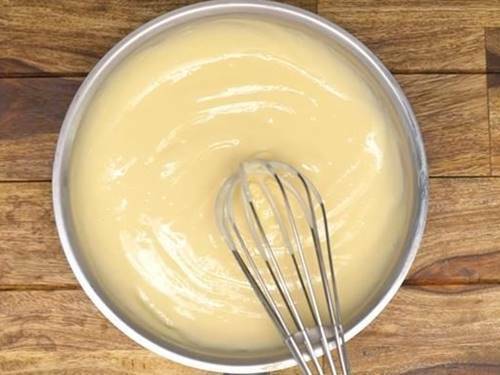 Whisk the mixture well to smooth custard. 9. Cover it immediately otherwise a layer forms on the custard. When it cools down keep it in the fridge until chilled. 10. Wash the fruits well. Chill them too while the custard chills. 11. Just before serving the fruit custard, chop them to bite sized pieces. 12. Add them to a serving bowl. 13. Whisk the chilled custard well until smooth. Pour the custard over the fruits. Gently mix. 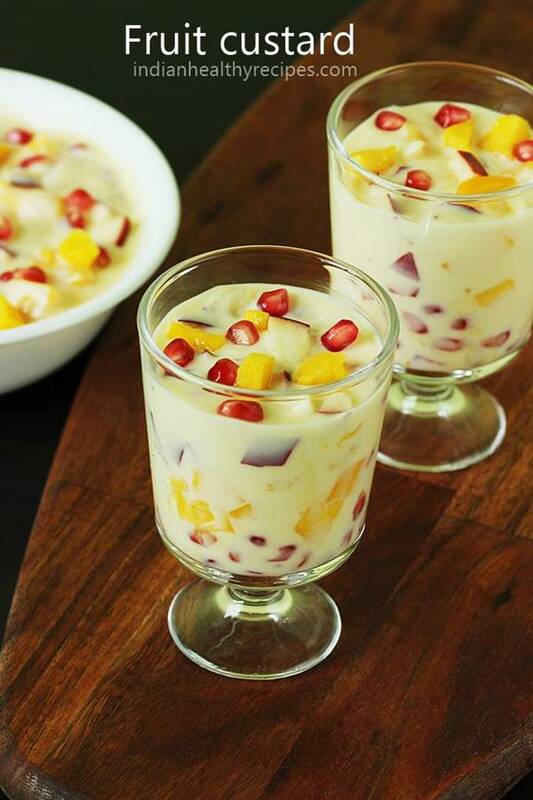 Garnish fruit custard with some pomegranate seeds. 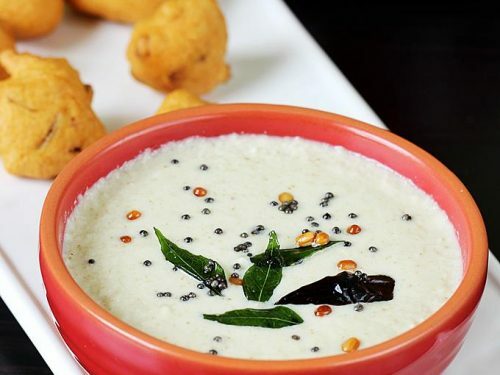 Hi,I am just 12 and just tried this recipe.It’s very easy and worked really well.The instructions are also easy to follow.I used Maida in place of custard powder and it still worked. You are welcome. I am just speechless. At the age of 12 you made a good fruit custard just by following a recipe. Amazing! I am so happy. Thanks a lot for the comment. God bless! What can I use instead of white sugar..I tried it with palm sugar crystals nd the custard have a bitter taste…can u suggest any alternative? you can try with organic sugar or stevia. This fruit custard doesn’t turn out good with anything else. Hi swasthi, Sonali from Maharashtra. Loved your recipes specially the chutneys. 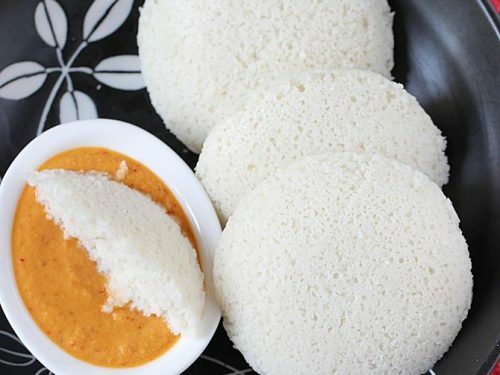 Very traditional with no twist and lesser ingredients. All the best and stay blessed😃. Thank you so much for the wishes. So glad to know you like the recipes. You can chill the plain custard but should not be after adding fruits. 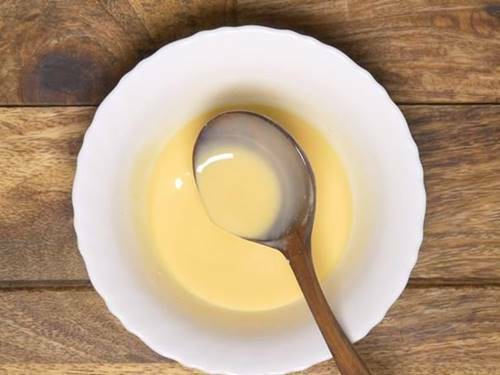 As the cut fruits release juices the custard becomes thin. So chill the fruits separately and the custard separately. Mix them just before serving. Where will I get eggless without artificial colors powder? 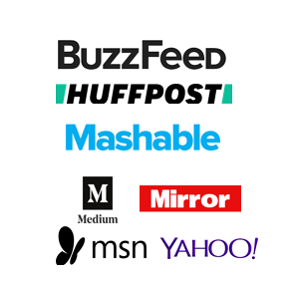 All recipes are very very goog and very systamticaly. Explained.. Thank you very. Much. I tried one and it turned very well. 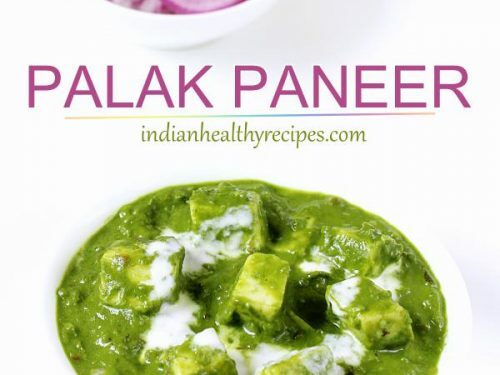 Hi swati i always opt for ur recipes as it is not jus read but also shown in pictures that helps a lot step by step… Wonderful….